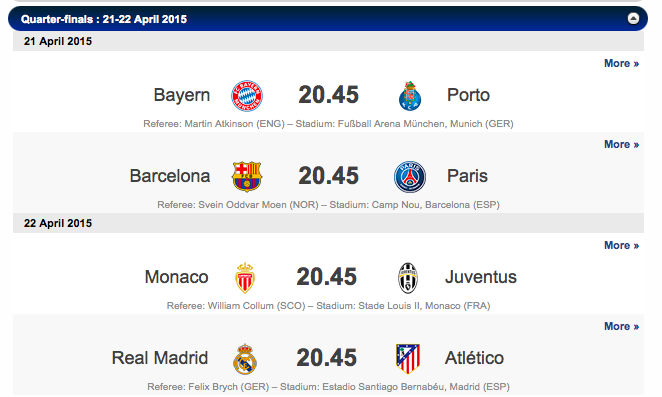 Yes, German referee Dr. Felix Brych will be in the center for this rematch of last year’s Champions League final. Aside from being one of the prettiest referees out there, Brych (above) is a highly-educated, thoughtful, calm and considered official. He is not, however, overly fast, to put it in the gentlest terms. While his overall demeanor is a good choice for keeping the peace, it will be interesting to see if he can keep pace with the speedy Spanish sides. Wednesday will also bring some excitement in the form of Monaco v. Juventus, and I’m pretty stoked to see William Collum of Scotland get the nod. This is no doubt one of the biggest assignments in Collum’s career, and it bodes well for his future with UEFA and FIFA. On Tuesday, England’s Martin Atkinson will take Bayern Munich v. Porto. Norwegian official (and Brych’s fellow on my World Cup Hotties list) Svein Oddvar Moen is in charge of Barcelona v. Paris.